From the Hancock County Courthouse, go east 2 blocks on Broad St. and turn right on Boland St., which becomes Linton Rd. Travel 11 miles, bearing right (after about 8-1/2 miles) at the Linton / Beulah Highway split, to Hitchcock Cemetery Rd. Turn left and travel 1.9 miles. Turn right on Indian Trail / H.B. Dixon Road and go 0.4 mile to a dirt road (Powerline Rd.) on the right. Follow Powerline Road for 0.8 mile. A hunter's camp is on the left, and the cemetery is beyond it, about 100 yards from the road. Age about 80 years. w/o J. B. Underwood. "My own dear wife has gone." She was a kind and affectionate wife, a fond mother, and a friend to all. At rest. w/o J. D. Underwood. "Father" on top of stone. He died as he lived, trusting in God. w/o Sam Yarbrough. All info per funeral home marker. Very difficult to read, especially first name. Marked with a deteriorating wooden marker. Possibly is Sam Yarbrough. d/o Mr. & Mrs. W. I. Simpson. Possible graves. Difficult to tell - large empty spaces in cemetery. s/o W. G. and Clara Turner. Asleep in Jesus. d/o Asa S. & Thomas Ann Simpson. Heaven retaineth now our treasure, earth the lowly casket keeps, and the sunbeams love to linger, where our little Mollie sleeps. Blessed are the dead / Which die in the Lord from henceforth. Within wire fence with graves 32 and 33. Within wire fence with graves 31 and 33.
d/o I. M. & L. U. Wood. Of such is the kingdom of heaven. Within wire fence with graves 31 and 32. An amiable father here lies at rest / As ever God with His image blest, / The friend of man, the friend of truth / The friend of age, the guide of youth. w/o J. M. Harrison. Patient, Humble, Christ-like. d/o J. M. & E. P. Harrison. Beautiful, lovely / She was, but given, / A fair bud to earth, / To blossom in heaven. s/o J. M. & A. F. Harrison. Our darling one hath gone before, To greet us on the blissful shore. Ordained to preach in 1866. m. Aug. 6 1844 to Areanner McClellan who is on same gravestone. His wife; m. Aug. 6, 1844. We have fought a good fight, we have kept the faith. We rest together here, for the resurrection morn. On same gravestone as James B. Roberts. s/o J. M. & E. P. Harrison. Tis a little grave, But oh have care, For world-wide hopes are buried there. w/o Rev. Berry Peeler. Her happy soul has winged its way to one pure, bright eternal day. Erected by W. P. Peeler. d/o W. P. and L. E. Peeler. This lovely bud so young and fair, Called home by early doom. Just came to show how sweet a flower, Paradise would bloom. s/o W. P. & L. E. Peeler. Forever with the Lord. m. Dec. 6, 1855. Thou shalt quicken me again, and shalt bring me up again from the depths of the earth. A large depression - possibly 2 graves. 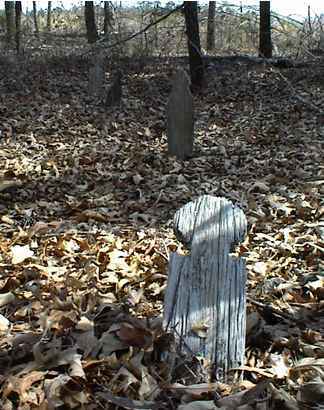 8 graves marked with wooden markers. 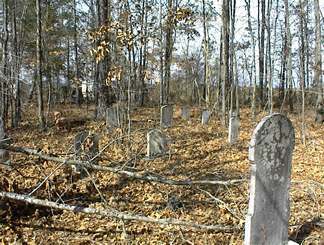 At least 10 graves, most with wooden markers. All info per Kimbrough. Grave not found in 2003.